Maggie Prescott, the fictional fashion editor in the film Funny Face, may have declared 1957 the year to “think pink!” but pink clearly appealed to fashionistas long before the mid-20th century. 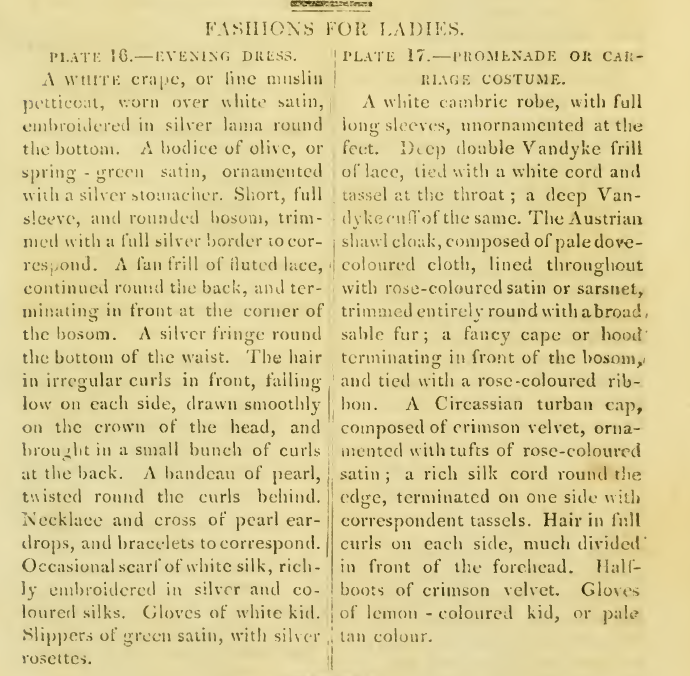 Ackermann’s fashion plates for April of 1814 feature pink in abundance. 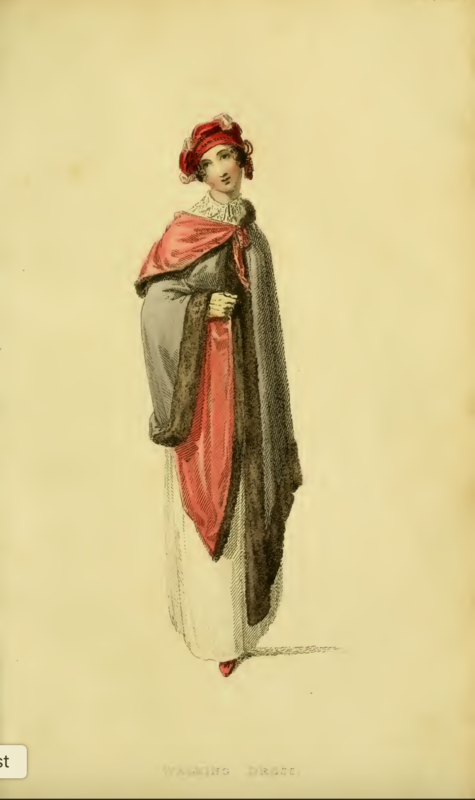 “Pale ruby” and “blossom-coloured” are the words used to describe the pinks of the mantle, hat, and half-boots of plate 24’s Promenade Dress, but pink they surely are. 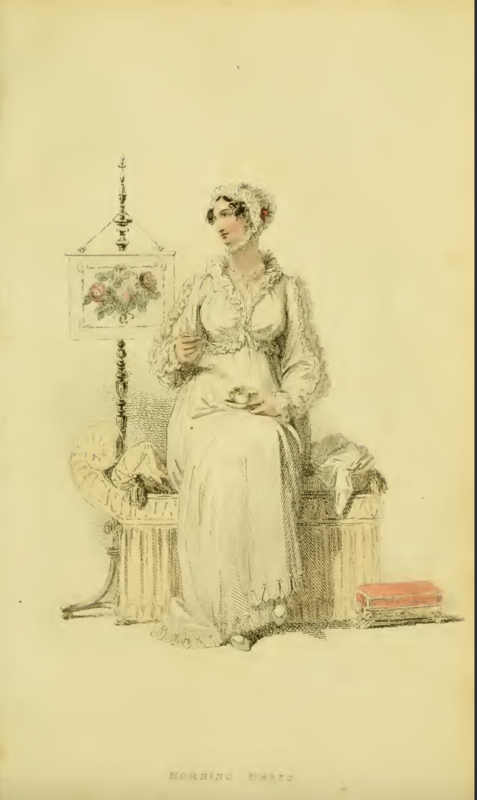 As is the petite footrest, the flowers on the embroidered screen, and the single blossom in the hair of the lady featured in Plate 25, all of which add a touch of color to the plate’s all-white Morning Dress. 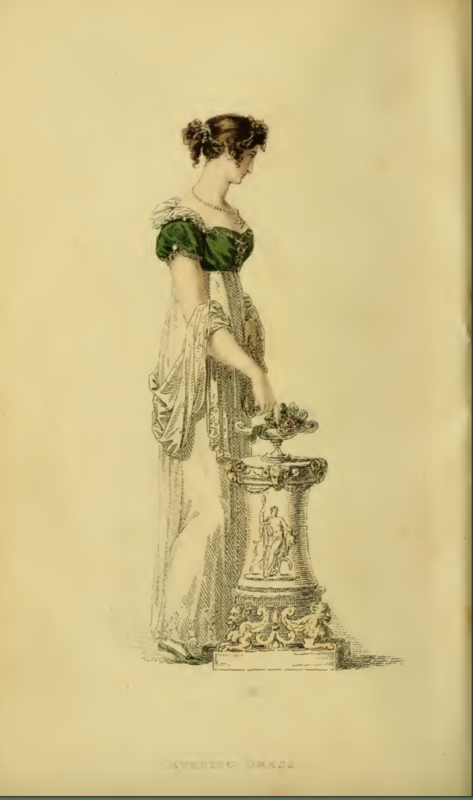 Sleeves in the spring of 1814 are “not so full as of late,” the description of plate 24 notes, although it is difficult to discern just how full said sleeve is, as it is covered by the lady’s mantle. I’ll keep an eye out as I post the rest of 1814’s plates, to see if this trend for less full sleeves continues. Once again, no fabric samples in this issue, only needlework patterns. 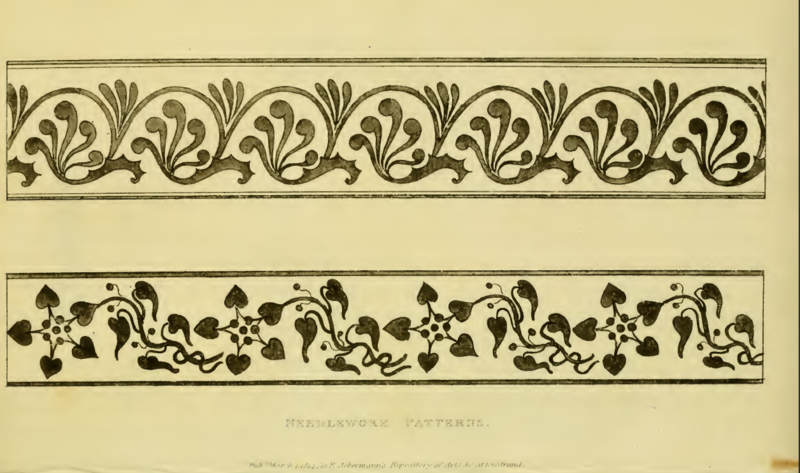 Said patterns show a clear shift away from the neoclassical, and toward the more naturalistic. Another trend int he making? I don’t recall silver being prominently featured in many Ackermann’s fashion plates. But for March 1814’s evening gown, silver is the accent color of choice to enliven a rather plain white dress. A silver stomacher ornaments an olive or spring-green bodice; a full silver border trims the sleeves and neckline; a silver fringe accents the waist; and silver rosettes adorn the slippers. Even the gown itself is “embroidered in silver lama round the bottom” (lama = cloth of gold or silver, originally made in Spain). Only the “fan frill” of lace on the back neckline and the pearls of the necklace and bandeau vary from the silver theme. 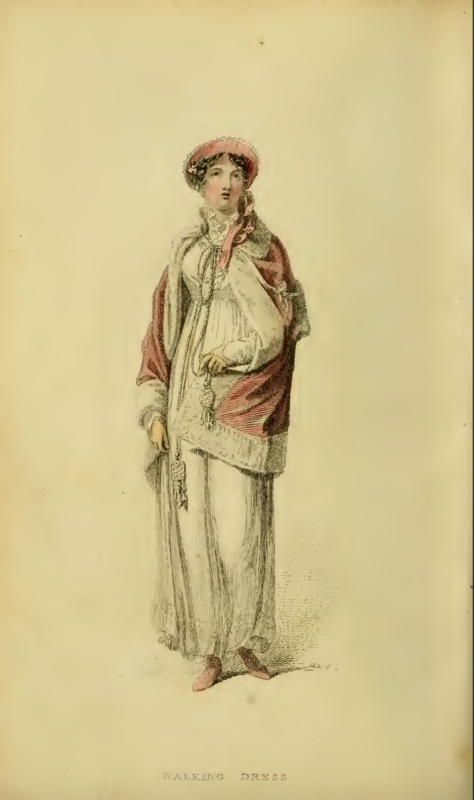 This month’s walking costume is more colorful; while its underlying dress is white and its covering cloak a neutral dove color, the lining of the cloak, the “fancy cape or hood,” the “Circassian turban cap,” and the half boots feature both crimson and rose. The white van Dyke lace at neck and wrists only accentuate the vibrancy of the reds. 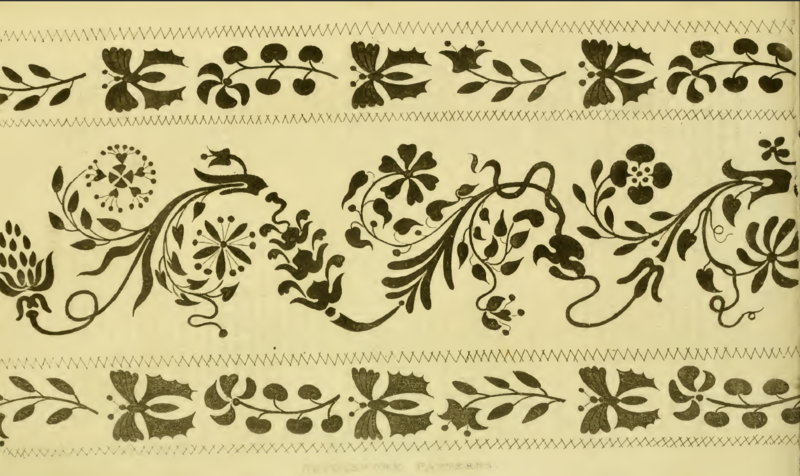 No fabric samples this month, but the issue does end with some intricate embroidery patterns of vines. The star and heart shapes of the second pattern seem unusual for the period; I wonder if the pattern was much reproduced? 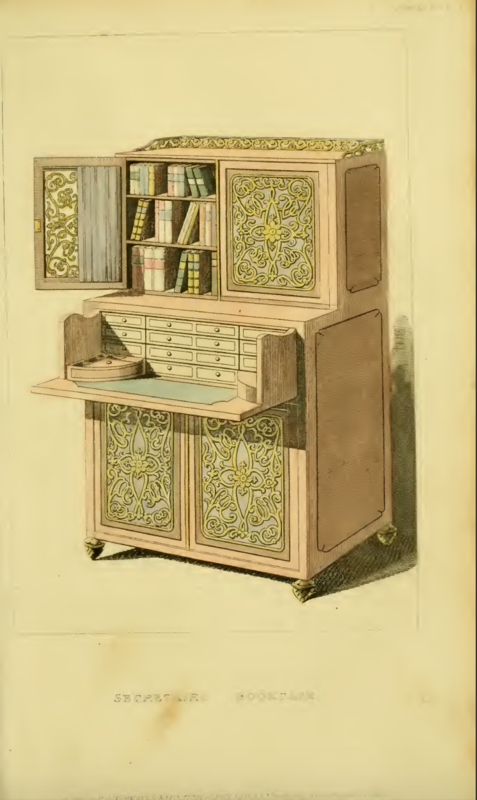 While I don’t usually include furniture prints in these posts, I couldn’t resist adding this one, which features a decorative ladies’ book-case. 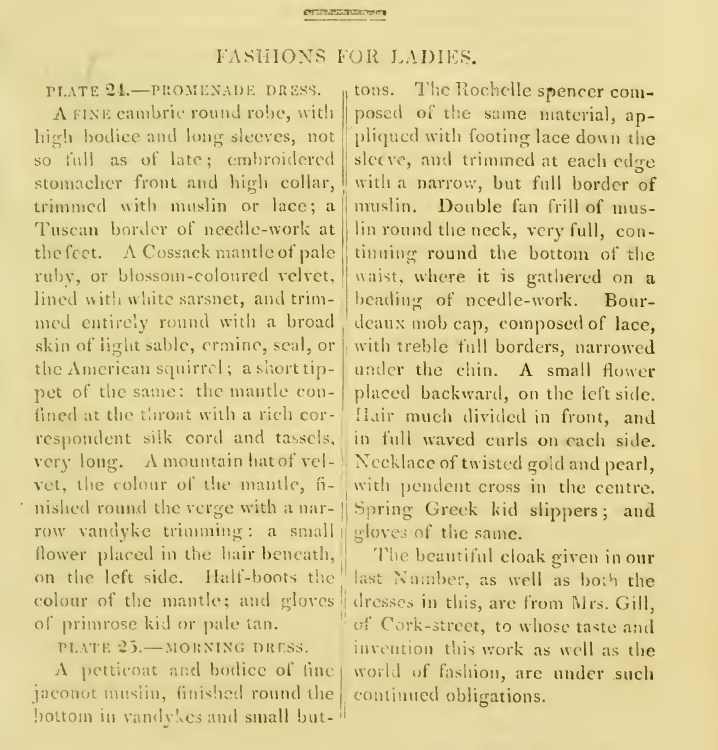 I found its folding doors and lots of drawers for storing all those little things a Regency lady might need to keep close to hand in her boudoir quite appealing. Too bad there are no titles visible on the books collected in this gilt-adorned piece of furniture—I would have liked to have known what titles Ackermann’s thought Regency ladies of 1814 would most likely keep close to hand . . .